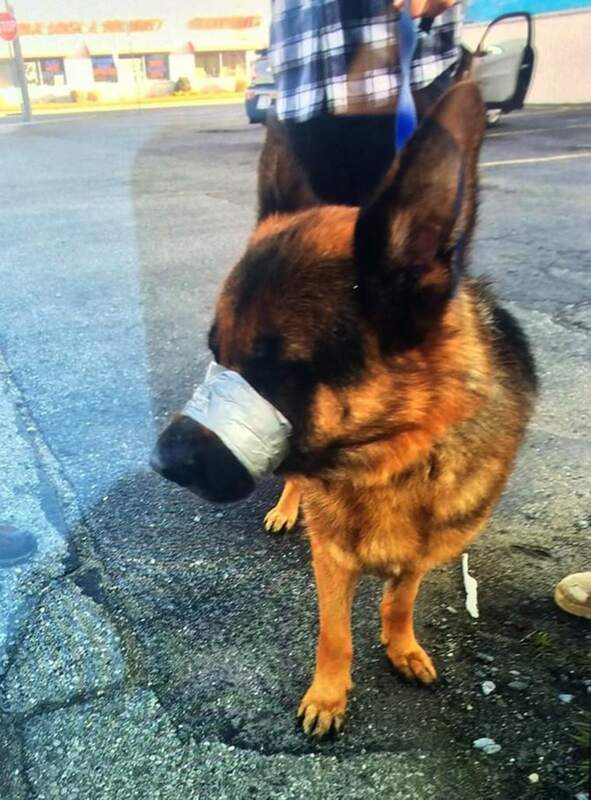 Police are asking for the public's help in finding whoever duct-taped a dog's mouth shut and left him stranded on the side of a Long Island, New York, highway. The 2- or 3-year-old German shepherd was found Saturday on Montauk Highway in Lindenhurst, authorities said. Roy Gross, chief of the Suffolk County SPCA, told NBC News that the dog "didn't seem to be in this condition for long, so we believe this is something that happened last night or sometime late yesterday." Gross said he is in good health and has been socializing with people. "He's the kind of dog who if he ran away on his own, he would walk right up to you," said, adding, "I can say whoever did this is a truly heartless individual." The Suffolk County SPCA said it is offering a $2,000 reward for information leading to an arrest for such a "heinous act of animal cruelty." Gross stressed the importance of getting the perpetrator or perpetrators off the streets soon, saying that "people who hurt animals like this hurt people." The investigation is ongoing, and anyone with information is asked to call the Suffolk SPCA at 631-382-7722.